The competition has aimed to alleviate global water scarcity by accelerating technologies that harvest fresh water directly from air, with 10x improved economics and usability vs current atmospheric water harvesting tech. 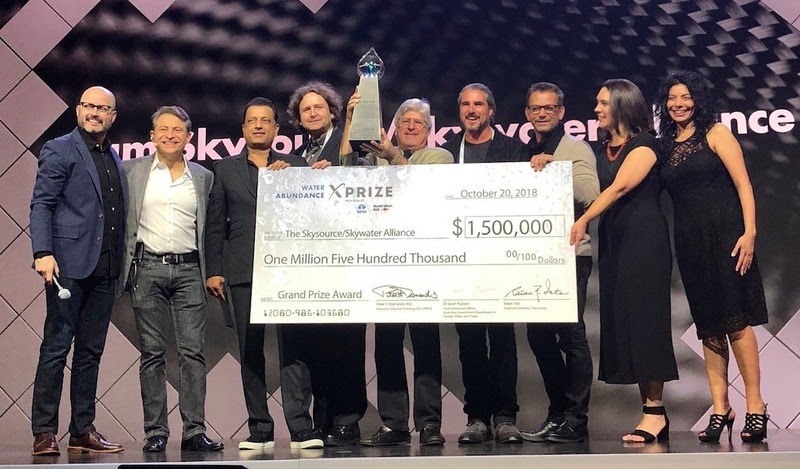 The Skysouce/Skywater/APL team won by delivering a novel biomass gasification based high-volume water generator that can be used in any climate, meeting the competition parameters of extracting a minimum of 2,000 liters of water per day from the atmosphere using 100 percent renewable energy, at a cost of no more than 2 cents per liter. The novelty of the Skysouce/Skywater/APL solution is the integration between the standard APL PP30 Cogen-CS power generation system, and the standard Skywater vapor compression cycle atmospheric water generation (AWG) machine. 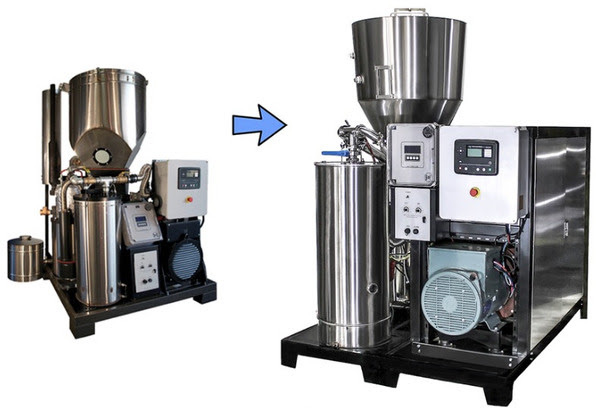 More specifically, we developed a biomass drying system placed between the two products, so that water vapor from the drying process can augment the humidity intake to the AWG machine. This enabled us to create an artificial high temp / high humidity environment for the AWG machine, meeting or exceeding the usual tropical conditions required for good AWG water yields. We did this while operating in the cold low water holding air of Berkeley, CA. In practice, a standard AWG machine won’t really work in Berkeley late Fall air conditions. But we used “Berkeley air”, augmented with biomass, to exceed the high metrics of the competition and win against competitors working in the tropics! All of us in the biomass powergen industry consider water in biomass a problem to get rid of. Though this contest, we discovered that it can, in fact, be a tremendous resource for co-production of potable water, while simultaneously delivering the usual electricity and sequestration of carbon through biochar. 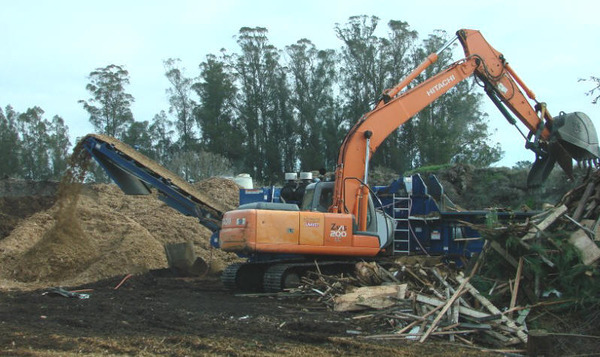 We realized that biomass is a major untapped water resource with global availability. It should be added to the list of water resources typically assumed: rivers, lakes, rain, wells, ocean, and air. For a video summary of the competition, and some shots around APL while we were testing, see here for the XPRIZE produced video of the process. Looking towards productization, we designed the components for the XPRIZE test rig to fit inside a standard 20′ shipping container. This container-based integration, with side wall openings for access, is the form factor we plan for ultimately bringing this Power, Water and Carbon Sequestration solution to market. 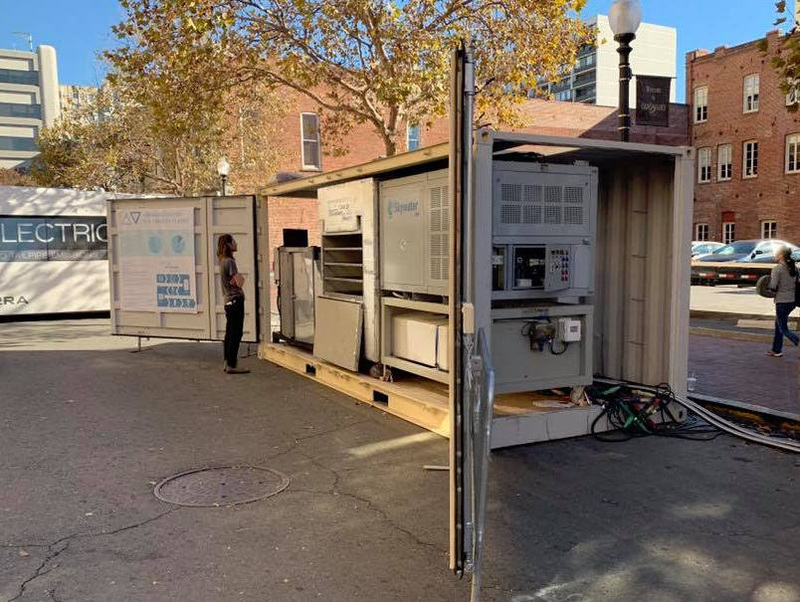 The first containerized product prototype is shown above and below while being demonstrated as part of the microgrid at the Verge conference in Oakland in late October. The WEDEW Watertainer uses the standard PP30 Cogen unit, with full utilization of its CHP features to enable the controlled drying process. 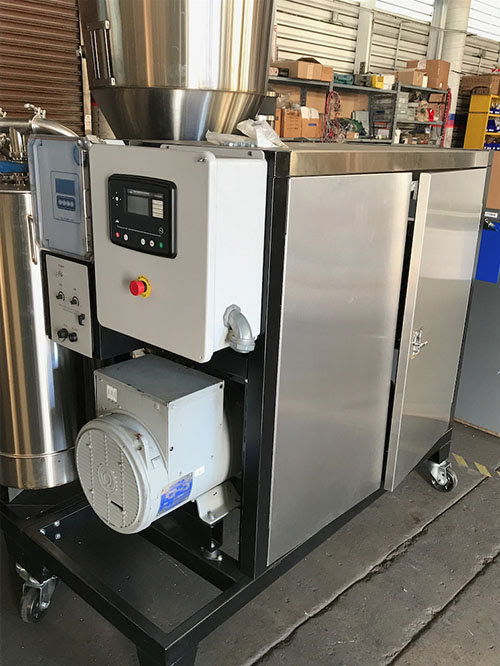 All of our work on the XPRIZE project was enabled by the new CHP features of the Power Pallet: in this case applied to a highly controlled drying process for specific temp and humidity flow delivery to the AWG machine. We will demonstrate the WEDEW Watertainer system at our next Open House, Friday, Nov 9th. We will not have the full container available (as it is currently in SoCal) but will have a second assembly with all major components operating outside at APL Berkeley. We invite you to join us and see more of the details of what we did to win this global technology contest. The Open House is an opportunity to see APL machines in operation and discuss your potential projects to use them. We always have a PP30 Cogen-CS CHP installation up and running for the show, as well as other varying machinery throughout the year. The “varying machinery” for this event will be a very interesting zeolite based adsorption chilling system made by Fahrenheit in Germany, which we’re powering with the hot water output of the PP30. 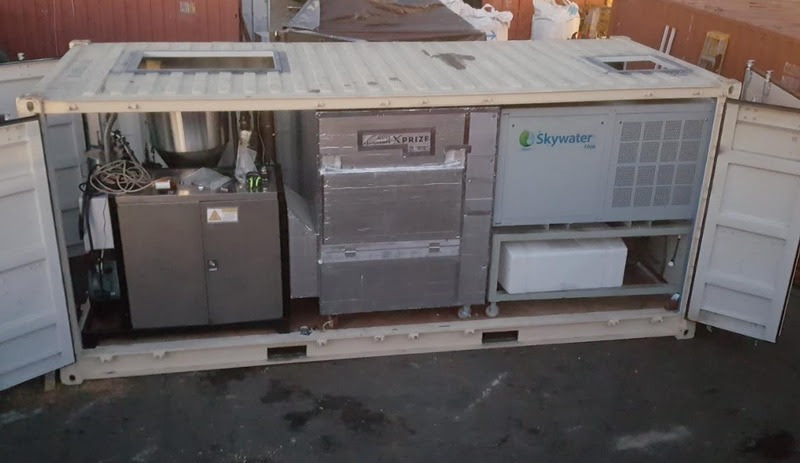 Also onsite will be an atmospheric water generation machine machine by SkyWater that we’re integrating with the PP30 for a Water Abundance X-Prize entry (more on this in future news). APL staff will be onsite to answer questions throughout the event, as well as available for longer discussions pre and post event. For those who have been debating a visit to have a larger strategic partnership discussion, the Open House is a good excuse to finally do it. We do encourage longer stays around Open House days so we can schedule one-on-one extended meetings to discuss more involved projects or partnerships. Please write us separately at sales@allpowerlabs.com if you want to arrange a dedicated discussion. Starting this Open House we’re expanding the event also host Local Carbon Network (LCN) activities. 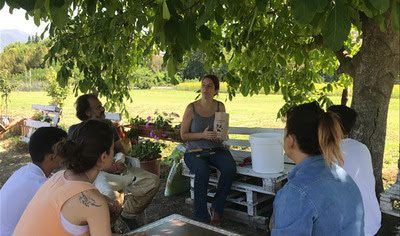 Over time we plan to grow this into a monthly meet up we’re calling the “Local Carbon Farmer’s Market”. This will be a gathering where you can pick up your Local Carbon Biochar, learn how to use it, and explore the related soils and climate management opportunities with other enthusiasts. Each month we’ll have talks, workshops and other info sharing will help you to make a direct impact on carbon drawdown with your own hands and soil. For an abundance of clarity, the Local Carbon Farmers’ Market activities and PP30 Cogen-CS machinery demonstrations will happen at the same Open House. This is one event, with two related but different tracks of activities. In the future we may need to divide them into 2 separate events, but for now, it is one tent. We look forward to seeing many of you at our new product Launch Party later this week. We have 60 people RSVPed so far, which is approaching the attendenance levels for our full workshop weekends of years ago– which is great. We also have some surprisingly dedicated international travellers coming for the event. We’re of course very happy to see this much interest in our new product. We have space for ~100 people, so if you want to be there, please do RSVP to the event page soon. The event will be a formal presentation by APL Founder/CEO Jim Mason on the new concepts and features of the PP30 Cogen-CS, as well as run demonstrations with several machines on site. We will have walk around demonstration stations for the PP30 Cogen-CS, previous PP20 for comparison, Local Carbon Network biochar information/char, and–maybe most importantly–a walk in “beer cave” shipping container, cooled with our new absorption chiller. A CHP hot tub post party is also rumored. Many of you have requested a full technical specification sheet for the new machine. We’re happy to provide one, as we’re rather happy with the details of what we’ve been able to accomplish through this major generation change of the Power Pallet. Below is copied the full technical spec sheet, divided into typical topic blocks, and with all the details that the obsessives want to know. 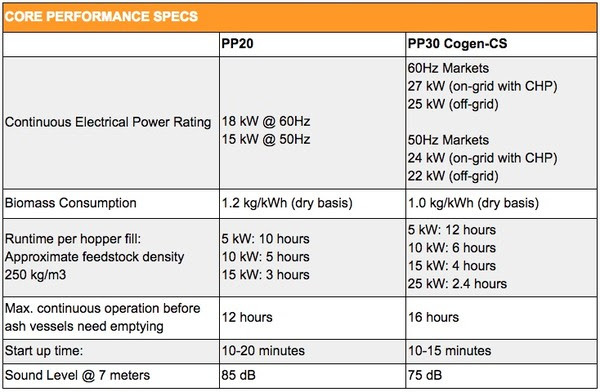 We have crafted the spec sheet as a comparison between the PP20 and PP30 to help highlight the changes, and where possible clarify how we achieved the numbers. Close inspection will be rewarded. You can also find the same spec sheet as a downloadable file here. Higher power output through larger displacement and higher compression Ashok Leyland / Hino engine, with high efficiency Marathon genhead. 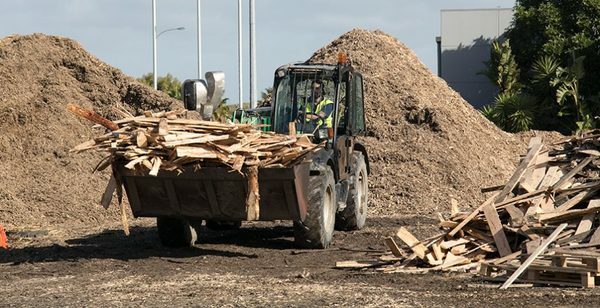 Major efficiency increase in biomass-to-power from 1.2kg/kWh to 1.0kg/kWh– a 20% reduction in biomass consumption. We actually see it a bit below 1:1, but for now we’re happy to represent a scale scale gasifier engine system that can operate at the 1:1 threshold. This is unheard of for small scale machines previously in the industry. High efficiency three stage CHP system utilizing engine cooling water, engine exhaust and gasifier waste heat. Each 1 kW electricity produces 2 kWt heat. 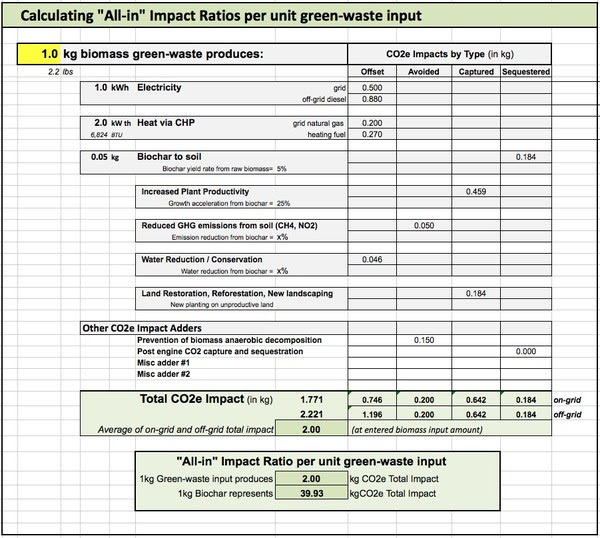 This 1:2 ratio similarly exceeds the prior art in biomass gasifier based CHP systems. Major emissions improvements with an upgraded catalytic system and engine tuning. 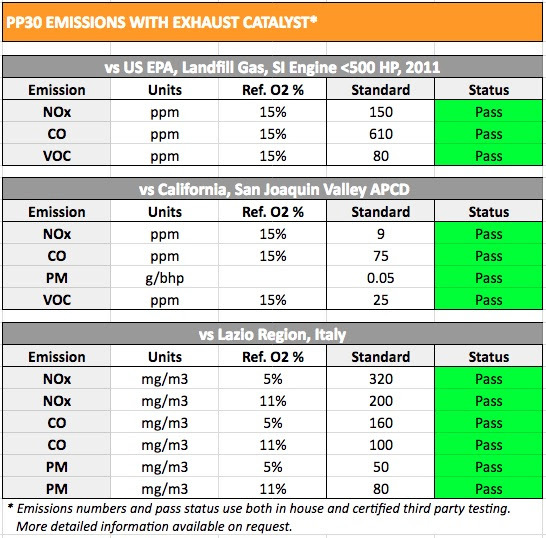 We are now able to meet California regulatory standards–even the Bay Area Air Quality Management District ones–for both for criteria pollutants and air toxics. These California standards are much more aggressive than we’ve previously encountered in Europe. Both the Berkeley engineering group and the APL Italia Modena engineering group have put a great deal of test work into characterizing our emissions across load, timing and mixture ranges; and then using these sweeps to find system configurations which optimize for the minimum intersections. The result is exceedingly low numbers and ability to meet even CA standards–which at times seem like you have to make stationary engine emissions approach indoor air quality levels. Well, not quite, but the thresholds are brutal. See numbers below. Operations and maintenance refinements across all systems; with particular emphasis on a new engine with in-frame rebuild kit capability, and a temperature controlled filter/cooler system that prevents final condensate, and allows for real time soot cleaning of heat exchanger while running. 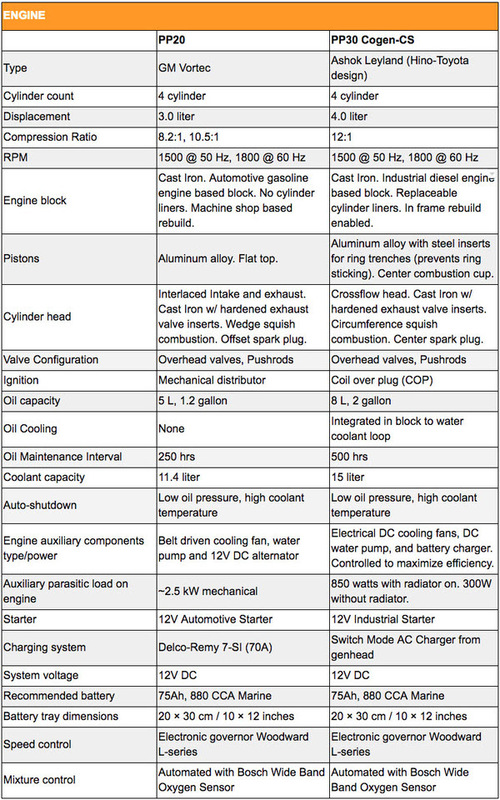 And with that quick cheat sheet, here finally is the full comparative spec sheet for your consideration . . .
All Power Labs invites you to join us for a special Launch Party on Friday, June 29th in Berkeley, CA where we will debut the new Gen 2 Power Pallet. The event will be a formal presentation by APL Founder/CEO Jim Mason on the new concepts and features of the PP30 Cogen-CS, as well as run demonstrations with several machines on site. As many of you have noticed, APL has been rather quiet for the last two years in terms of new announcements and deployments. 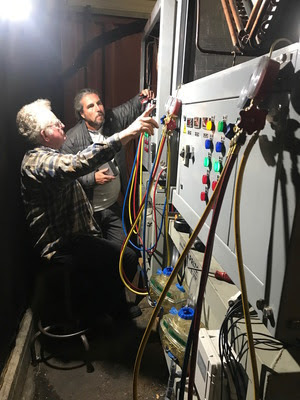 The pause has been enabled by significant grant funding from the California Energy Commission and US National Science Foundation, which has enabled us to do a full redesign and generation change of the Power Pallet. After nearly a decade of on-the-ground work around the world–starting with the GEK DIY kits and continuing through the grid tie Power Cube–we’ve been blessed to have a funded pause where we could redevelop our core product from scratch, in relation to the totality of our learning to date. The result is the new PP30 Cogen-CS. We believe it represents a major step change beyond anything offered in the industry to date. We’re excited to show you all that we’ve been able to achieve. 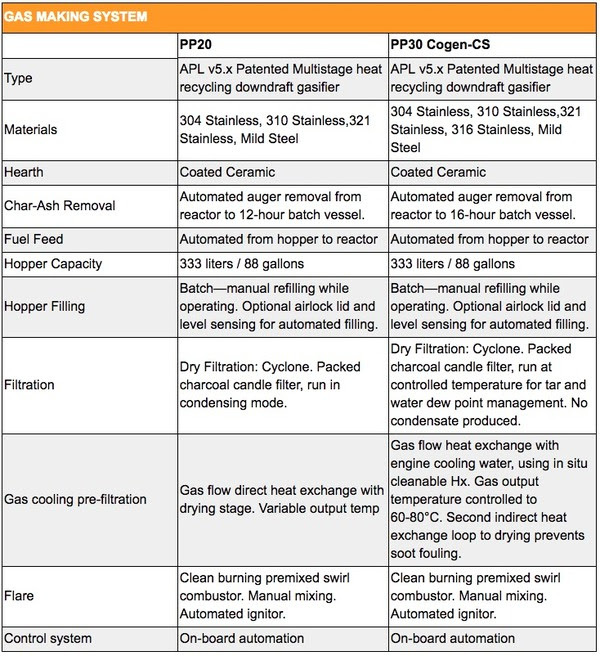 During the Launch Event we’ll demonstrate a variety of new capabilities on the PP30 Cogen-CS including; higher power output, high efficiency CHP utilizing both engine and gasifier waste heat, optimized biochar output, quiet run enclosure, and operations and maintenance refinements across all systems. 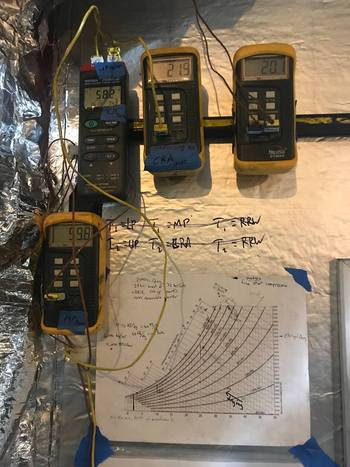 We plan to put the CHP heat output to good use making a hot tub human habitable, as well as driving an absorption chiller we’re currently testing for refrigeration and air conditioning uses. The absorption chiller is not quite yet a regular sales offering, but it is something we plan to offer as an add-on in the very near future. As usual, the point of APL events is for you to put your hands on the details of the machines, meet the people that develop them, and discuss how we might collaborate on projects in your region. We invite you to join us for this and more. The event is free, but those interesting in attending need to register here. 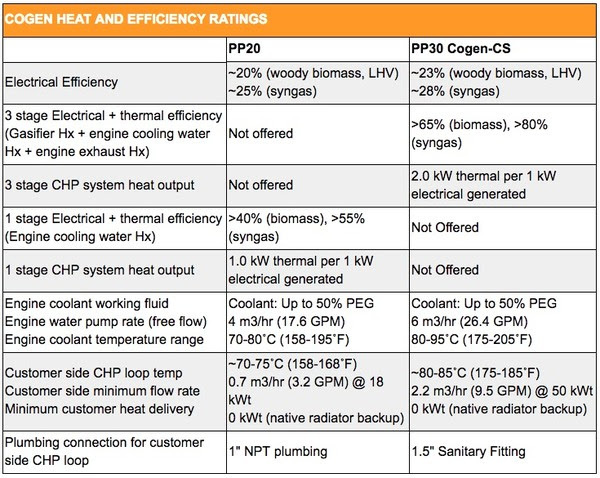 PP30 Cogen-CS: New FeaturesIn the coming weeks we’ll explore the new concepts, features and functions of the PP30 Cogen-CS in detail through a series of APL News posts. Today let’s get started with a high level summary of the main points of interest. Higher Power output: ~25kWThe Gen 2 Power Pallet uses a new 4.0L 4cyl engine at 12:1 compression ratio, in combination with a new high efficiency genhead to produce a continuous 25kW at 60hz, and 23kW at 50hz. The system will support temporary loads above this, but for continuous rating we are confident at 25/23kW for 60/50hz markets. The limitation in the 60hz market is now the gasmaking system capacity, not the engine, thus the 50hz rating is not derated by raw rpm/hz%. After a large survey of value optimized engines of the world, we have exited the previous GM, and selected the Ashok Leyland H4 from India– an engine based on and further developed from the Hino/Toyota W04. This engine was the workhorse HIno medium duty diesel truck engine in the 80s and 90s. More recently, it is the engine that powers 100s of thousands of CNG buses in India, and equally proven over extensive powergen deployments globally. The engine is a heavy duty industrial power plant, with a long list of features that result in quiet operation, high efficiency, extreme longevity, and ease of rebuild via removable cylinder liners and in frame rebuild kits. Also, most importantly, the factory delivers it painted fire engine red, so it goes extra fast! Ashok Leyland is a major new strategic partner for APL and the Gen 2 Power Pallet. 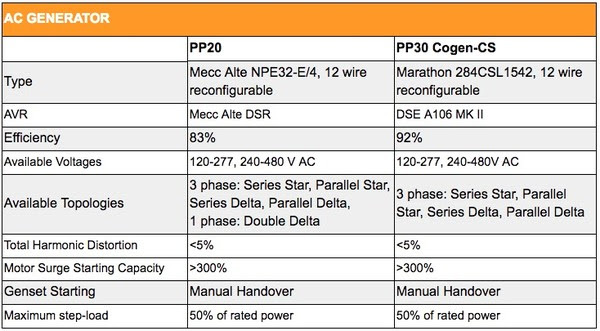 We’re highly excited by the new capacities they’re bringing to the APL effort, both in engine supply, as well as more broad manufacturing services for the genset part of the Power Pallet. The best and highest use case for our machines has always pointed toward CHP. The problem has been adding the extra CHP related components without destroying the price point for the total machine. After a long cycle of value engineering, we’ve figured out how to offer multistage CHP–utilizing gasifier waste heat, engine cooling water, and engine exhaust–without the typical 2x or 3x price multiple on the raw genset. We’ve been able to reduce the cost far enough that we’ve decided to just make the CHP native to the machine. 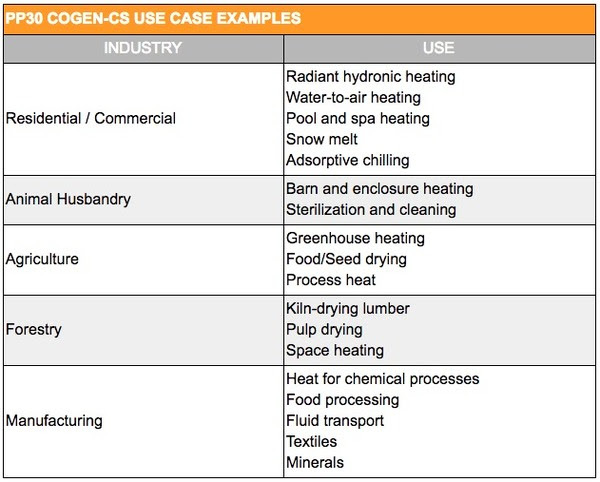 Cogen standard highlights the unique value a biomass based genset can offer beyond an electricity only renewable; extending renewables to solve typical heating needs without the typical fossil based solutions. The base CHP system is 2 stage (gasifier Hx and engine cooling water). The engine exhaust gas Hx is an optional add-on that completes the full 3 stage system. If using all 3 CHP stages, each 1kW electricity generated will produce 2kW of thermal output. Total system efficiency with the 3 stage system is ~70% calculated from raw biomass, or ~80% if calculated from input syngas. Our climate trajectory requires carbon drawdown, not just carbon emission reduction. 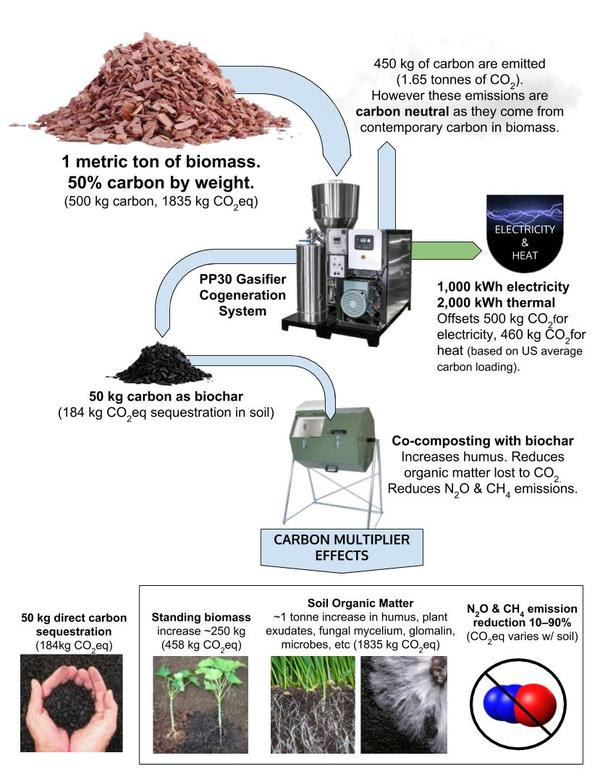 Gasification + Biochar is one of the very few pathways for carbon drawdown that is currently accessible and ready to engage with current technology and products. And it’s already built-in with a biomass gasifier engine system–no extra carbon capture and sequestration machinery required! The new PP30 Cogen-CS enables deployments of this solution with a dedicated biochar collection system, larger collection bins on both reactor and cyclone, and temperature controlled collection environments that prevent PAH condensation on the char. Default biochar mass yield rate is 5% of biomass in. The gen 2 Power Pallet comes standard with a new half enclosure solution: the genset side is enclosed, but the gas making side is left exposed for ease of access. 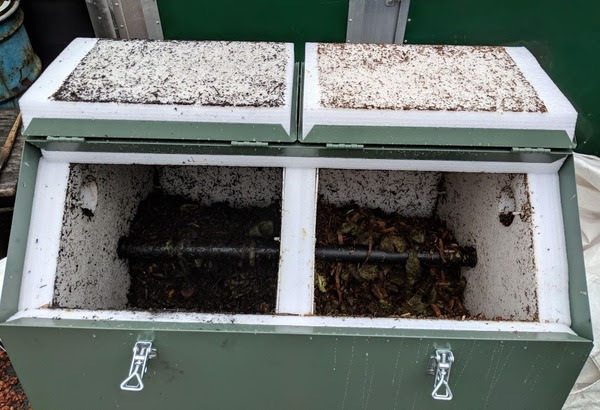 Previously we found the full enclosure of the Power Cube to be a liability for operation and maintenance, and have decided on this half and half solution as a better optimization of protection vs access. The resulting enclosure is smaller and thus less expensive to make, so we’ve decided to also make it standard with the product. Now, all Power Pallets are quiet running, and genset enclosed. No more exposed engines on open skid! Most users have tended towards ordering the Power Pallet with grid tie and paralleling capability, so we’ve decided to make it standard on the new generation machine. Now all machines arrive ready to sync to typical global grid configurations, as well as enable multiple Power Pallets to parallel together. The machines can still run off-grid with the same Deep Sea multifunction genset controller / synchronizer that is used for grid-tie, but now with the added benefit of full power meters and configurable run parameters and safety settings. The rub for high uptime gasifier projects is always the real O&M rate. If there has been a core design challenge and development priority for the new Gen machine, it has been to transform the reality of O&M rates typically experienced in a biomass gasifier-engine system. Driving this O&M rate down has been our main engineering, test and documentation focus for the last two years at APL. In the process, a long list of items have been reconceived or refined across all Power Pallet systems: gasifier, filtration, heat exchangers, genset, and automation. The details are many and will be the main focus of coming APL News posts. 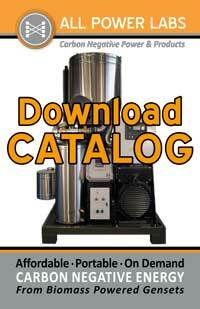 The price point for the new full featured PP30 Cogen-CS system is approximately $2/watt. 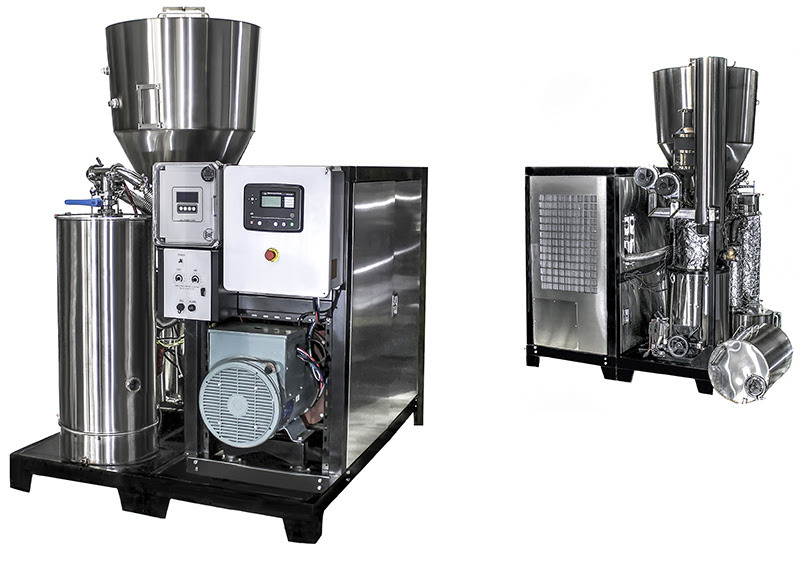 The base machine includes the new enclosure, grid tie, and CHP as standard, with emissions catalyst and continuous feed system as add-on options. This base machine is more expensive than the previous base PP 20 Power Pallet, but about the same as the full featured version of the PP20 with all the add-ons. It is also a bit less expensive than the previous Power Cube (which it replaces), though with much more delivered. We have decided to standardize on this more full featured configuration, as this is how most people have wanted the machine. We realize this will be less attractive for some simple off-grid uses, where a less featured machine is desired. We plan to offer these lower feature machines in the near future, but are starting with the full featured configuration as standard as this is how the majority of customers want it. If your use case argues for the less featured form of the machine, do write us and we’ll keep you informed about the timeline for these later releases. More info, pictures and technical specs will continue in weekly APL News posts for the next month. If you can’t wait and want a full spec sheet now, or more specific pricing and availability info, please write sales@allpowerlabs.com. Yes, we are already taking orders for and delivering the new machine as of June, 2018. 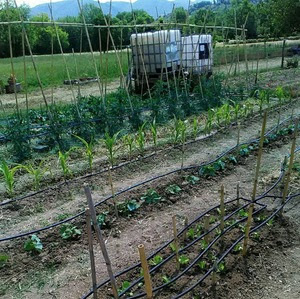 Deliveries of your sponsored Local Carbon Biochar have already begun to our partner Carbon Farmer organizations in the East Bay of California. So far these are of course very small scale, but we wanted to complete the full cycle right from the beginning of the project. 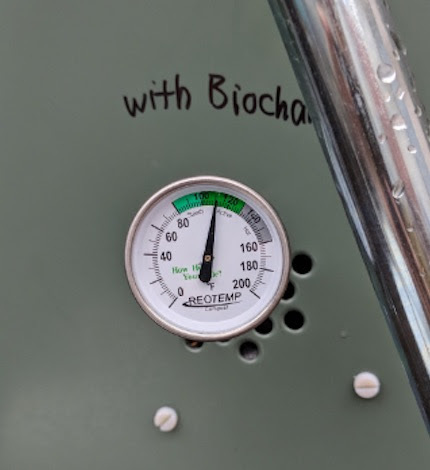 The first 15kg char has gone to Ashby Community Garden, Emeryville Community Garden, and the UC Berkeley Gill Tract Farm, for a total CO2 impact equivalence of 300-600kg in principle (though in practice, not all CHP fossil displacements are in place yet while making this early char). 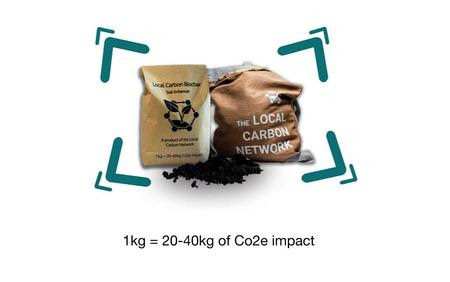 We will be publishing a progressive tally of biochar delivered to soil and CO2e impact achieved by the total project. This will soon be live on a new Local Carbon Network website, but in the interim, we have spreadsheets and graphs as below to keep track of our progress. 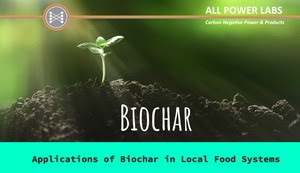 We have a great collection of local organizations enthusiastic to receive your sponsored Local Carbon Biochar and put it to good work in soil. 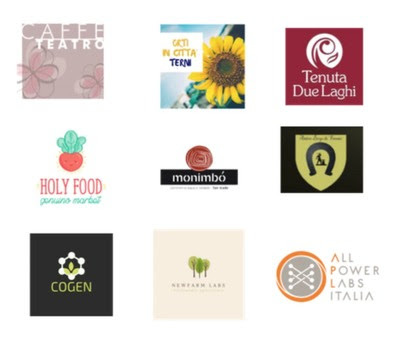 The current list of participating organizations is below. 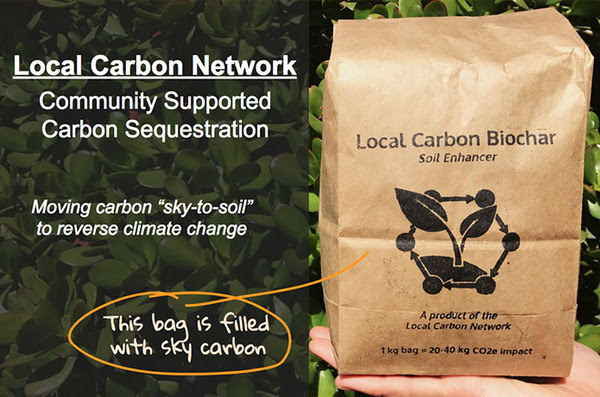 You are welcome and encouraged to suggest other local gardens, farms, schools and otherwise where you would like to see local carbon returned to soil. 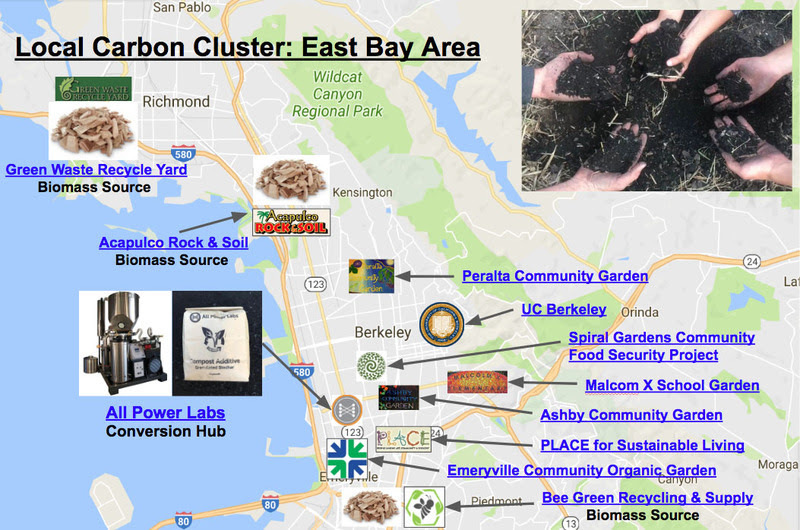 The East Bay Local Carbon Cluster will develop permanent CHP powergen and biochar production installations at the first two green-waste management sites on the list below, with the rest following in later growth stages. All of the sites listed below serve as existing green-waste consolidation points for the East Bay, and currently have an excess of Local Carbon needing a solution. These green waste conversion sites, combined with the local gardens and farms listed above, make the East Bay Carbon Cluster. Your sponsorships directly increase the amount of green-waste carbon that is “fossilized” to soil in this social-soil-eco-system. The Local Carbon Network model is designed to be easy to replicate and scale across other Local Food, Farmers’ Market and green-waste ecosystems. 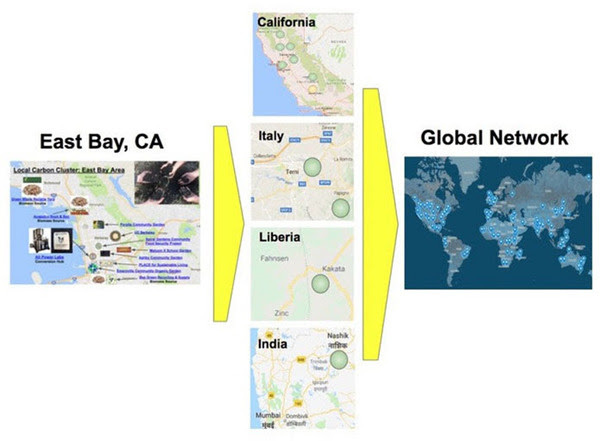 The “proof of concept” East Bay Carbon Cluster is the template we intend to test and refine, making it easy to pick up for additional Local Carbon Clusters in the US and globally. APL will orchestrate some of these directly, but also invite others with interest (like yourself dear reader) to set things in motion independently in your local area. Success in this initial East Bay capital campaign fund and deployment will justify follow-on campaigns and deployments dedicated to other Clusters. APL intends to followup on the East Bay campaign with additional Local Carbon Clusters in California, Italy, Liberia and India. These areas will be next as projects can build on business and service logistics already established by All Power Labs (APL) in these markets, and demonstration projects already operated to success. We also invite you to suggest other areas where a local carbon cluster might be relevant in your area. After nearly ten years of technology development, business partner establishment, and on-the-ground infrastructure building, APL is ready to make a consequential impact on energy and agriculture transformations in these regions, while drawing down carbon from the global pool during the process. The Local Carbon Network intends to create and support long-term stewardship of gigawatts of carbon-negative power and product deployments, with the ultimate objective of enabling a 10-40ppm drawdown in global CO2 concentration over the next century. 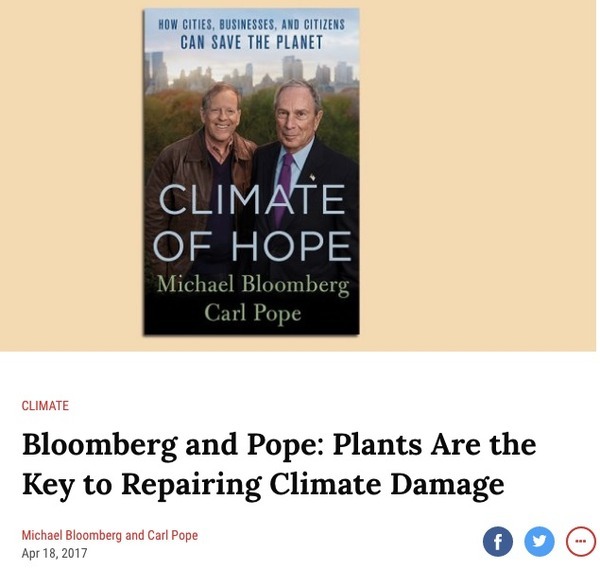 A 10-40ppm drawdown is approximately 10-20% of the carbon reduction that will be needed to maintain global temperature increase below 2˚C– the commonly-accepted point that will stave off catastrophic climate change. We will not do this as a single company, but as a full industry pursuing the “Global Carbon Management through Green-waste mangement solution”, we just might be able to make it happen. 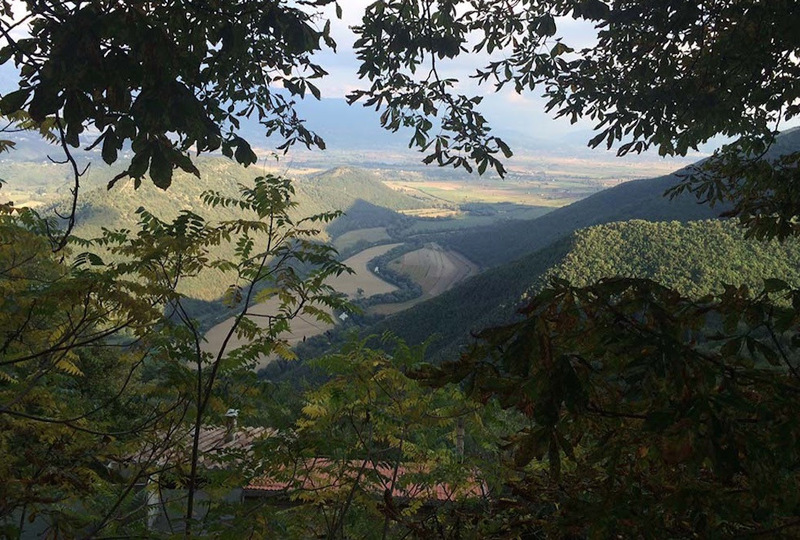 “Global Carbon Management through Green-waste Management” is the most powerful tool we currently have available to drawdown carbon for global climate benefit. The Local Carbon Network is bringing together the Plants + People + Machines to make it happen at scale. We hope you will join us by sponsoring bags Local Carbon Biochar or PP30 CHP Machines to enable the first roll out.